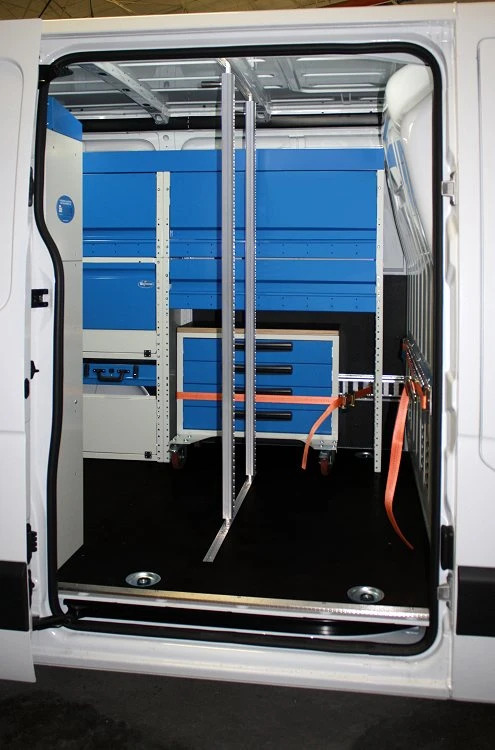 The pictures of an upfit of a NISSAN NV400 L1H1 with a section on wheels, making it easily transportable. Sometimes worksites cover vast areas and it's impossible to get your van anywhere close to the area where you need to work. This is often the case for the owner of this Nissan NV400 who takes care of installation and maintenance of industrial machinery. It is exactly for this reason that different sections of the racking units can be mounted on a wheel base – this way they can be simply rolled wherever they are needed on the worksite. 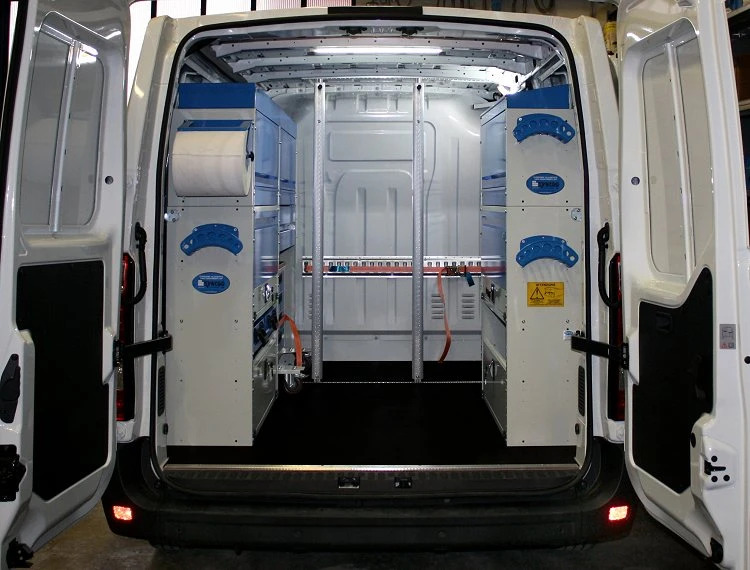 Looking at this upfit up close, you can see that - like most upfits - we installed the Syncro resin-coated 12 mm plywood floor panel, complete with recessed steel anchorage points for securing cargo, and protective steel borders along the edges where the van doors open. But the upfit tour really begins when we start looking at the racking units installed on the left-hand side of the Nissan. Above the wheel arch base, there are a pair of relatively large sidewalls, with a lockable front door panel, making the space around the wheel arch usable, as well as secure. Above this, there is a forward-slanting shelf that holds two metal portable utility cases. And above that, there is a closed shelf space with a lockable front door panel that opens out and upwards, handy for compact spaces. Above that is yet another closed shelving space with a gas-activated front door panel. 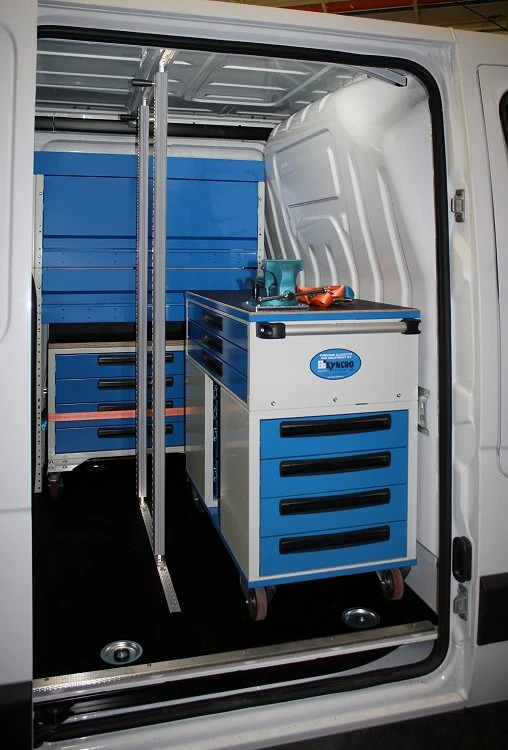 Moving towards the bulkhead of the van, the righthand side of this racking unit consists of two side panels that create a frame for the compartment housing of the tool trolley unit which is mounted on wheels and completed with a 25 mm wooden worktop. The upper part consists of two shelves closed with a front door panel. 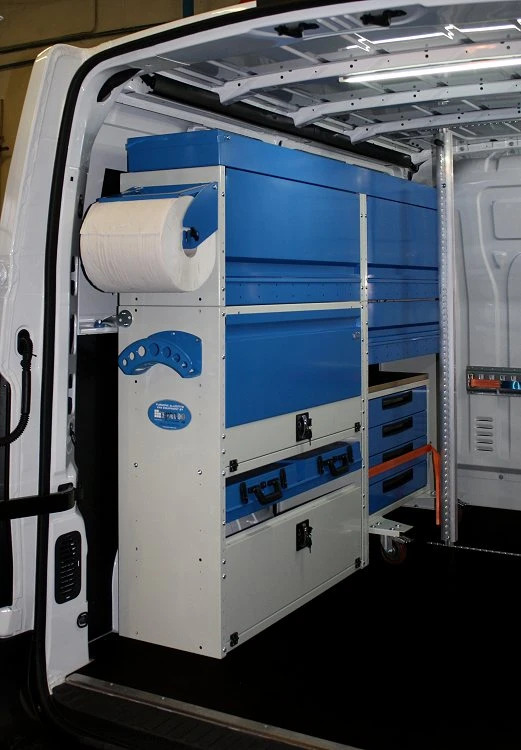 Running the length of the top of the whole left side racking unit is the Syncro shelf with raised sides and end locking flap, made for securing and transporting long objects. 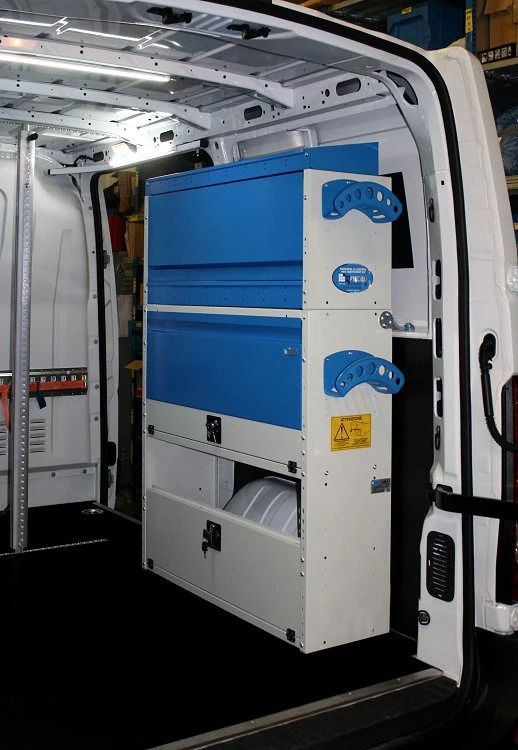 On the right side of the van there is another closed shelf space with a lockable front door panel that opens out and upwards. And like the left side, above that is another closed shelf space with front door panel. On the top, is a shelf complete with raised sides (higher in the back), dividers and rubber mats. Just inside the sliding side door, we installed two load lock bars with load stops and aluminum spring locks to secure heavy loads and machinery. 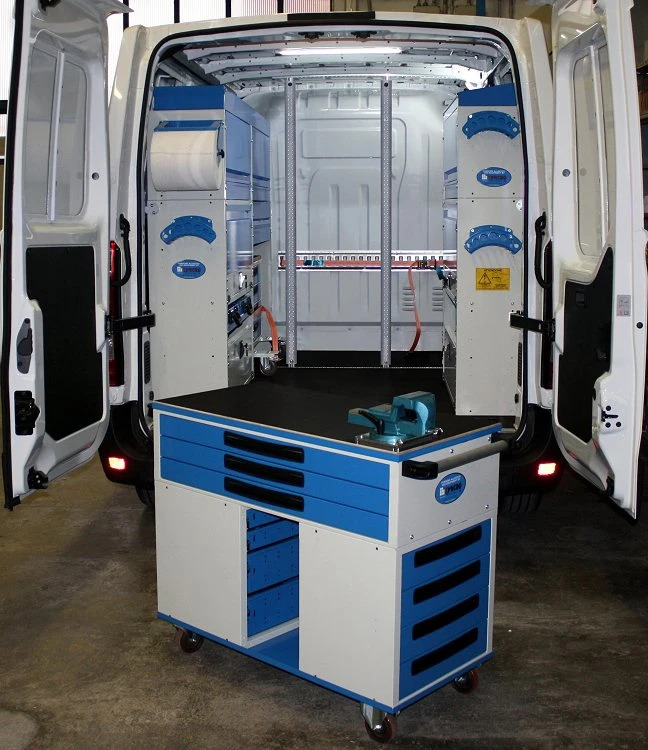 The part of the upfit that can be taken out of the van and easily transported around on the worksite is the removable tool trolley that is made up of a platform base frame with small two drawer units with metal drawers. Above them, we placed a third longer drawer unit with metal drawers and one with forward-tilting plastic drawers. On the top of the trolley, we mounted a resin-coated plywood worktop. The upfit was completed with a few key accessories: a paper towel holder with 280 mm roll, three hanging cable holders for tubing, extension cords, etc., and two LED ceiling lights – bright soft energy-saving light with thin (space-saving) design. Last but not least, are two aluminum tracks complete with tie-down straps to secure the mobile parts of the upfit. Click here to find out more about the NV400 upfits, floor and interior paneling.